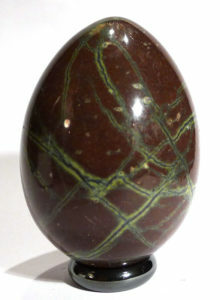 Serpentine has very few traditions associated with it, and in the past was primarily used for the prevention and treatment of snakebite, when it was worn, or placed directly against the skin to draw off the poison. However, this gives a clue to some of its current uses – particularly detoxification and support of the immune system. Its energy is subtle, but it is worth persevering with it. 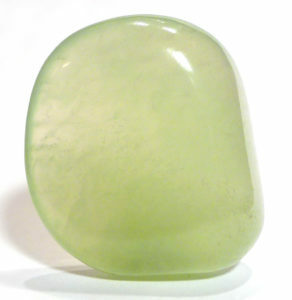 Serpentine calms, balances on many levels, and (with the exception of precious serpentine), has a very earthy, grounding quality, making it a good choice for holding in meditation, especially when the user finds it difficult to calm the mind. Gienger recommends it for peaceful conflict resolution, which makes sense, as it definitely soothes ruffled feathers. Melody associates it primarily with the stimulation and balance of Kundalini, presumably because of the serpent association. It is used widely in the treatment of some heart complaints, such as arrhythmia, and also irritable bowel syndrome (IBS) and abdominal cramps. 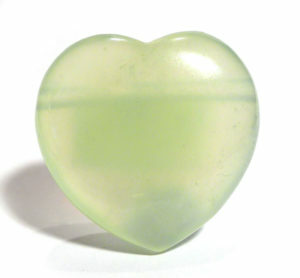 Most serpentine leaves the user feeling lighter and more balanced. 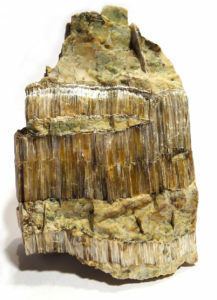 Serpentine is a group of at least sixteen different related hydrous silicate minerals, which are divided into four structural subgroups: chrysotile, which is fibrous and used to produce asbestos; antigorite, which occurs in corrugated plates or fibres; lizardite (named after the Lizard Peninsula in Cornwall), a fine-grained variety; and amesite, which forms platy or pseudohexagonal columnar crystals, usually massively or as pseudomorphs. 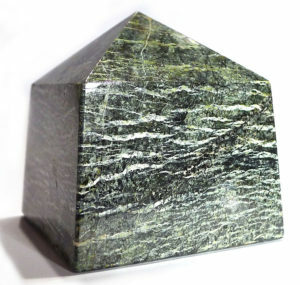 Serpentine occurs as a secondary mineral, resulting from chemical alterations of olivine, aphiboles or pyroxenes. Its localities are so widespread, it is impossible to list all sources. 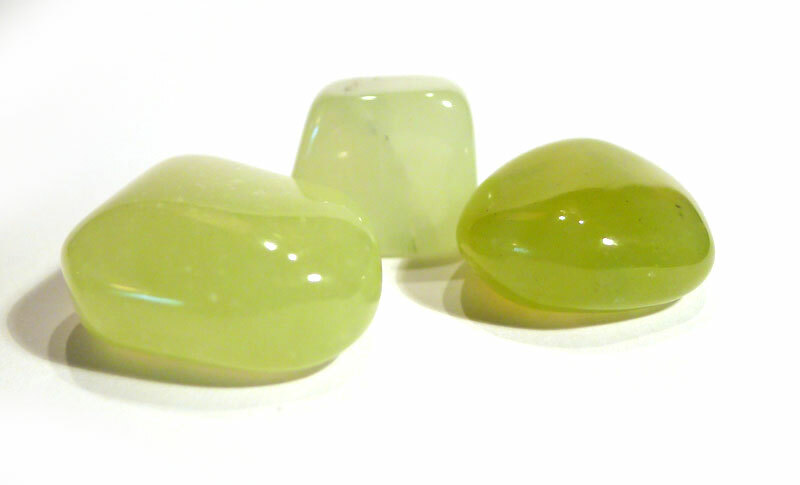 Rich, translucent apple-green varieties are sometimes called “precious serpentine”, “noble serpentine” or “Chinese serpentine”, and marketed as “new jade”.